I love gathering blackberries. I look forward to it every year. This season has been a slow one, though. We have collected only a couple of pounds, nothing like our last harvest. Some say that means we'll have a mild winter. Maybe. I've used an older Making Memories design here - and it turned into an 8.5x11 because I had already used a bit for something else. I haven't done any this size since last year's Christmas album. Time for a few more, I'm starting to think..
Paper Bag Update : with a message for Louisa-Jane. I'd be happy to send you some bags if you email me with your address please. I'm sending out the last few tomorrow. Gorgeous page Sian, such lovely colours. And I love the tiny photos! Ooh I'm a huge fan of crumble, blackberry being my absolute favourite. I love the vintage home spun feel to this LO, especially the lovely white stitching. It doesn't look sewn in the close up, so I'd love to know how you did it? I'm quite the convert to the 8.5x11 size, somehow it is just easier to fill! Crumble night sounds good to me ... I'll just pop over then? I adore crumble. Caig makes a wicked banana and custard crumble that is delish both hot and cold but because he doesn't like it much we rarely get it. Mother of all crumbles still has to be rhubarb for me though. With evap milk over the top. Ommmmmmmmmm. 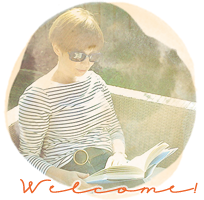 Love this page - that background you've used is gorgeous! LOve the idea of regular crumbles ... can I come to dinner? love this page, crumbles are a regular pudding at our home although I try to resist! A crumble Every Monday? Wow - I want to live at your house! I like crumble. A lot. Especially when there's lots of apple and lots of topping. Yes. I do like blackberries, but the pips in my teeth drive me nuts, so I tend to avoid them... or mix with apple (which makes a few go much further anyway). So I will stick to apple, or pear, or pear-and-apple, or apple-and-raspberry, or rhubarb, or rhubarb-and-strawberry (with elderflower cordial for extra zip!). Oh, how rude of me to nearly miss it... I actually did mean to comment on your rather spiffy scrap page, honest I did! I do like that format and the printed kraft paper background is cool. As are the multiple strips of pinky patterned papers... and lace... and stitched rub-ons... and cute pink flower... and funny little orangey flower.. Well, in fact, I just like it all. A jolly nice page - and the photos are pretty too. It's amazing how well you make a page, with such little photos... I think that's clever! Great LO Sian...now I want crumble- rhubarb is my fave though! Love that you used a recipe-themed paper for a memory about favorite foods! Really cute layout. I'm a big fan of crumbles as well....you could stretch the blackberries by having blackberry and apple crumble....delicious....and we love some oats mixed into the topping as well. I'm also a fan of the 11 x 8.5 size...they come together quickly.....but still have plenty of room on them....love this page. I'll be round on Monday then. Great page to celebrate a great pud! OOO LOVE that MM print- will have to try to source it! GREAT page- the color palette is so pretty! I love those alphas as well- this page pulled together beautifully! Blackberry crumble- would love to see your recipe for it but I can look it up and try it- sounds delicious! Hmmm...a crumble... I wonder if that's like our "cobbler" in the US. Sounds yummy. There's a blackberry patch between home and our (former) northern property. One time Doug came home from a solo trip and his fingers were purple. I got excited thinking he'd stopped to pick blackberries but on further inquiry found that he had stopped and ATE blackberries... didn't bring any home! :o\ boys. Deb - I'm going to Google cobbler..
A very lovely LO Sian :) and apple crumble is my favourite! I love this page! What a perfect background sheet! Very eye-catching layout. Love the layout and I am sure my guys would be thrilled if I mad a dessert once a week. Like Deb I am wondering if this is similiar to our cobbler or more like a crisp. Crumble sounds the perfect Monday treat you have a lucky household. I'm going to keep quite or I could end up with a request for crumble. I love the strips down the side especially. What a great weekly tradition - I think that would be a popular one in our house too! 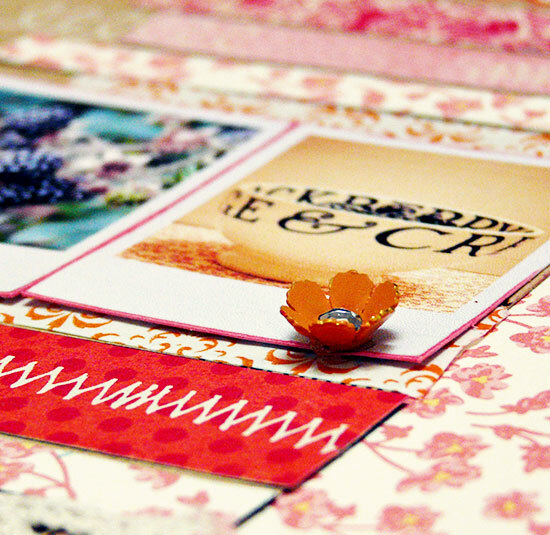 The small photos suit the layout really well, and the fabric rosette is so pretty. Just super! I love the 8.5x11 size too. Those little photos are perfect, and I like the way you've done the lettering too. So pretty Sian :) I love fruit crumble whichever fruit it is. I would love to have fresh blackberries, we buy them from the store and they just are not the same as the fresh ones :) Enjoy your Monday's! Lovely layout; I love the strips of paper down the side and that alphabet is wonderful. Lovely. I think the everyday life pages are some of my favorite. I should also do more 8.5x11 pages! That's a lovely page Sian and the background paper is yummy. Clever using rubon stitching, you got me fooled, I thought you had put it through the sewing machine or done it by hand. I love crumble too. Especially blackberry. The fruit here was really early this year, I was picking in July - can you believe that? I have cooking apples in my fridge, I may have to go make a crumble now you have bought it to my mind. With a hint of ginger in the topping I think. 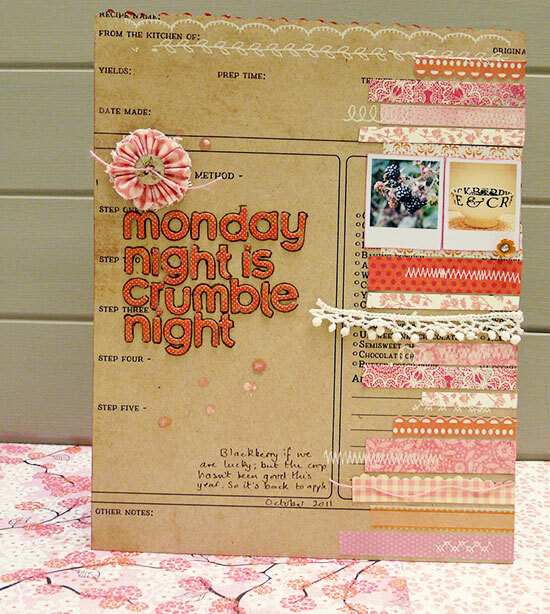 Enjoy your Crumble Mondays! I'm most miffed here in Southampton... the local council in their infinite wisdom (HA!... or lack of it!) has decreed that there shalt be no foraging on the common any more. No picking blackberries, hazelnuts, elderflower, hawthorn, crab apples... not a flippin nut or seed anywhere on council land is to be picked by the commoner of the city! Lovely page - beautifl colours - and my mouth is watering - blackberries or apple, rhubarb or any fruit,... crumble is DELICIOUS! Thursday is Burrito night at our house. Gorgeous. I think the blackberry harvest or lack of it might be due to the dry summer. 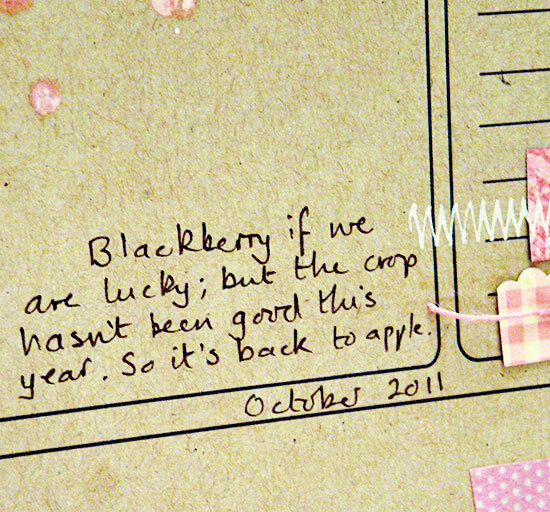 But then it was a bumper year for apples and pears and strawberries. I like the rubons across the top and the lines of ribbon with small photos v cute.